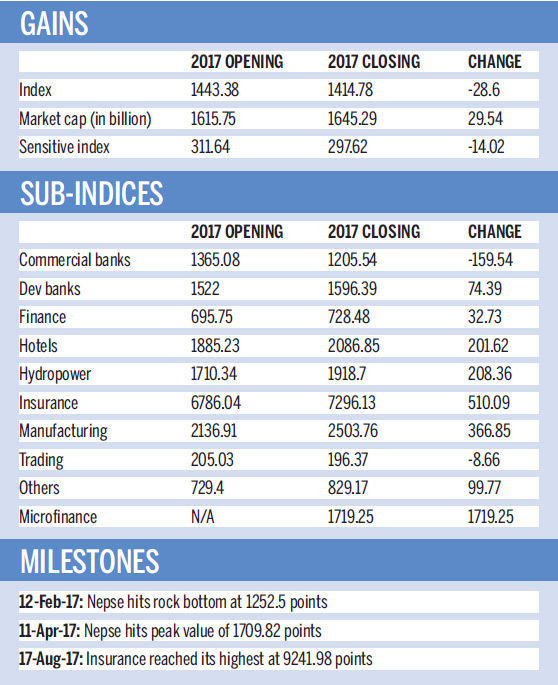 Nepal Stock Exchange (Nepse) index witnessed a roller coaster ride this year as the market went from highs to lows in an eventful year that consisted of multiple elections, fluctuations in bank’s interest rates, regulatory measures by Securities Board of Nepal (Sebon) and more. The market index kicked off the first day of trading in 2017 at 1,443.38 points and experienced a tumultuous year to end at 1,414.78 points on the second last day of trading. Sunday marks the last trading day of 2017. Over the review period, investors in the stock market gained Rs29.54 billion despite a fall in the Nepse index, with market capitalisation inclining to Rs1,645.29 billion from Rs1,615.75 billion. The market went on a downward spiral in the first two months of 2017 and reached the year’s lowest point on February 12, hitting 1,252.5 points. The shortfall in banks’ loanable funds had led to the downfall in the market index. Measures were taken to attract more investors with Sebon launching Applications Supported by Blocked Amount (ASBA), the platform that facilitates the processing of primary shares through the banking system and the government announcing the dates to hold local level elections. But the measures failed to garner investors’ attention which were fixed on the rising interest rates, according to a stockbroker who spoke under condition of anonymity. However, the market index eventually picked up steam to hit 1,709.82 points on April 11, the highest point in 2017. That day saw market capitalisation hitting Rs1,964.71 billion. But the market could not sustain that bullish pace, as the issue of holding timely elections of local bodies weighed on investors. This lead to the market index slipping successively to 1,583.57 points on July 17 with the market capitalisation also declining to around Rs1,700 billion. For the next two months, Nepse hovered around 1,500 points before going on a downward trend with the start of Dashain and Tihar, the main festivals of Hindus. During this period, the market was also affected adversely by Nepse’s announcement to postpone implementing the full-fledged online trading system that had been scheduled for November 7. In the last two weeks alone, following the conduction of parliamentary and provincial elections, the index plunged by 125 points leading to a dismal note for investors at the secondary market. Sebon Spokesperson Niraj Giri said investors’ confidence had been adversely affected by a number of factors. “High rate of interest, curb in margin lending by banks with the shortfall in liquidity, elections of local levels, province and parliament, downfall in the profit margin of a number of listed companies — banks in particular—and increased supply of primary shares with the listing of right shares and bonus shares were among the main reasons for the downswing in the stock exchange market,” Giri said. According to him, Sebon introduced a number of measures to regulate the market. These included the enforcement of ASBA system, extension of remote work stations outside the Kathmandu valley, expansion of working areas of merchant bankers, increase in number of clearing banks and increase in paid up capital for brokering companies to Rs20 million from the existing Rs2 million. Along with the fall in Nepse, the sensitive index that measures the performance of blue chip companies also fell 14.02 points to 297.62 points. Out of the ten trading groups, two groups witnessed a fall in their indices. Commercial banks’ index plunged the most, dropping 159.54 points to close at 1,205.54 points. For the remaining trading groups, insurance sub-index rose by 510.09 points, the largest of all. The insurance sub-index managed to reach a high of 9,241.98 points on August 17 before dropping to 7,296.13 points by the year end. The indices of manufacturing, hydropower and hotels also went up by three digits points—366.85 points, 208.36 points and 201.62 points respectively. The indices of ‘others’, development banks and finance companies surged by two digits points. For the first time, Nepse dissociated microfinance from the development banks sub-group, which closed at 1,719.25 points. Compared to 2016, daily trading amount in 2017 dropped nearly 50 percent. The average daily turnover came down to Rs500-600 million over the review period.